THE WORLD’S MOST EFFECTIVE MUSCLE BUILDING FORMULA! Experience the Synergy of Three! Countless scientific studies show they work: creatine, beta-alanine and L-carnitine. More importantly, they’ve been field tested. Taken separately they are effective, but when taken together they work exponentially to build slabs of rock-hard muscle, increase strength and shed body fat in record time! ONLY GP3 EVO™ delivers all three in a full dose mega-stack with a unique, advanced delivery system – the GP3 EVO Synergy System™. Creatine HCL – absolutely the most absorbable form of creatine (59x more than monohydrate). There is no need for loading or cycling and it won’t cause bloating or water retention. It will increase muscle size, strength, endurance and recovery. 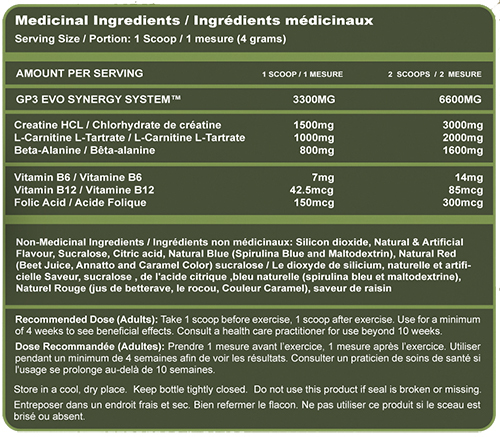 3000mg per serving! Beta-Alanine – increases muscle Carnosine levels and anaerobic endurance, boosts strength and power and delays muscle fatigue. Beta-Alanine may also amplify the effects of creatine. L-Carnitine Tartrate – improves strength and endurance, liberates fat cell to be utilized for energy, reduces muscle soreness, speeds healing, and elevates cognitive function. When do I take GP3 EVO™? Powder: For maximum results, on training days we suggest 1 scoop 30 minutes before training, and 1 scoop immediately following your workout. Some athletes may choose to consume 2 scoops while they train. On non-training days, we suggest .5 – 1 scoop upon waking and another .5 – 1 scoop eight hours later. Capsules: For maximum results, on training days we suggest 5 caps 30 minutes before training, and 5 caps immediately following your workout. On non-training days, we suggest 3-5 caps upon waking and another 3-5 caps eight hours later. Can I take GP3 EVO with food? GP3 EVO™ can be taken with food or on an empty stomach. Do I have to take GP3 EVO on non-workout days? Yes – it is important in order to keep your creatine levels up. As well, the other ingredients help you to repair from the previous days workouts and keep your body in an anabolic state. Do I need to cycle GP3 EVO? No, there is no need to cycle GP3 EVO at the recommended dose. It can be, and should be, used continually year round to ensure your gains continue. Besides GP3 EVO, what other supplements should I be taking? 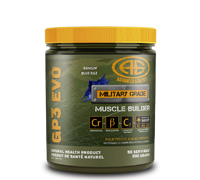 You don’t need to take any other supplements when taking GP3 EVO. It goes without saying, but even with the addition of GP3 EVO it is necessary to ensure you are ingesting the correct amounts of protein, carbohydrates, and fat to reach your goals. To maximize your gains, stack GP3 EVO with AMMO-8, NITRIC IMPACT, ALPHA and F-10. In fact, you can mix NITRIC IMPACT with GP3 EVO for the ultimate workout experience. Are there any long-term negative side effects? What results can I expect with GP3 EVO? Within two weeks you should notice an increase in strength, power, and endurance. You will also find that it takes less time to recover from hard training. Most users report more muscle fullness by this time and better pumps in the gym.